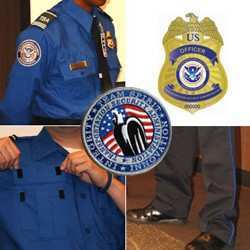 When it comes to the new uniforms now worn by TSA screeners, it's not the false impression of unearned authority that isn't wearing well... but rather the cheap quality of the spiffy new duds. The Chicago Sun-Times reports some employees have reported skin rashes, lightheadness, respiratory distress, and other ailments since the agency rolled out new uniforms to 43,000 Transportation Security Administration workers last summer. While many law enforcement officers -- real ones, the ones who went through weeks of training and have the authority to arrest people -- took umbrage with the police-style unis now worn by their lesser brethren, as it turns out the false sense of authority may not be the biggest problem with the new uniforms... but rather the formaldehyde used in the manufacturing process to keep the clothes free of mildew and wrinkles. "This is something we've seen at airports around the country," said Emily Ryan, a spokeswoman for the American Federation of Government Employees, the union angling to formally represent TSA workers. The problem seems confined to uniforms manufactured in Honduras; workers wearing uniforms imported from Mexico reported no rashes or other ailments. Perhaps not surprisingly, TSA says it enlisted a third-party lab to test the uniform shirts in question, and found that every one -- including those worn by screeners complaining of rashes -- was within limits for potential irritants. AFGE president John Gage notes some TSA managers have used those findings to deny workers' compensation claims. "This is unacceptable," he said, demanding TSA tell supplier VF Solutions to recall and replace the uniforms. Other TSA workers have complained of weak seams in the bottoms of uniform pants, and difficulties with keeping the uniform stripe that runs down the length of trousers straight.